Japan is one of the world’s biggest and most developed economies with a highly entrepreneurial business environment and sophisticated consumer market. Japan is the EU’s second-largest trade partner in Asia after China and negotiations for a Free Trade Agreement are underway. The FTA is projected to further deepen trade between Ireland and Japan: in 2012, Japan was Ireland’s 11th largest trading partner in terms of manufacturing exports; bilateral trade reached €6.4 billion. 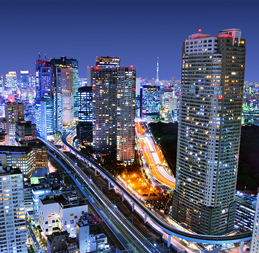 For more detailed information when trading with Japan, download our Japan Fact Sheet. For an estimate of landed costs (duties, taxes and other import fees) for shipments going to Japan use the free and interactive DHL Express Trade Automation Services (TAS) tool, tas.dhl.com. TAS also provides information on regulations compliance and trade documentation. Document shipments above 30 kg (66 lb) must be sent as goods. Japan Customs only accepts typewritten invoices. Private shipments will be inspected by Japan Customs before being delivered to the receiver. ATA Carnets must have a holder’s signature on the Carnet Form on the Japan Import Page and Japan Export Page (if exporting with DHL) – otherwise, they will be declared as dutiable goods. Receiver must pay additional charges for ATA Carnet shipments (JPY 7,800/shipment )and Bonded Transit Documents (actual fee + JPY 6,000/shipment). Non-document goods shipments for hotel guests will be sent on Delivery Duty Paid (DDP) Incoterm. Bonded storage fees will be applied after 6 working days; minimum: JPY 900 or JPY 15/kg per day, whichever is higher. Must be declared as goods. Maximum weight: 10kg (22 lb). Food licence required unless the receiver is a private individual importing for personal use, or a company importing samples (subject to Customs discretion). Required information: number of bottles, content volume, alcohol content, sparkling or not. Indicate type of skin/leather on commercial invoice. Only human biological substances can be exported to Japan, e.g. human blood samples. Provide CITES certificate regardless of weight. Attach component analysis table to commercial invoice. Include number of cigarettes on documentation. If more than 10 kg (22 lb) and for resale or distribution to unspecified number of general public: receiver to provide food licence. Receiver to provide import licence. Send as goods. Must have attached seal & visible external marks indicating that it is a diplomatic shipment – then it will not be opened, detained or taxed. Other shipments addressed to diplomatic entities (including private belongings of diplomats) must be accompanied by a completed 'KANGI' form (Request for Customs Exemption form) from Japan’s Ministry of Foreign Affairs to be exempt from duty. Shipper to provide declaration of contents. Shipments must fulfil International Air Transport Association’s Dangerous Goods Regulations (IATA's DGR). Provide shipper's declaration for dangerous goods and send under separate Waybill. Fire extinguishers: provide import license. Must be well-packaged – preferably in a wooden case and crate – to avoid damage. Subject to inspection by Japan’s Food Standards Agency..
Waybill, invoice & pre-alert must state ‘PERSONAL EFFECTS’ or ‘UNACCOMPANIED BAGGAGE’. Provide receiver’s full name & phone number. Unaccompanied baggage: provide Customs declaration form with Customs stamp & copy of receiver’s passport. Describe upper & lower sole materials and type of shoes on invoices. Samples must be marked & mutilated for duty & tax exemption; state 'MARKED AND MUTILATED' on invoices. Non-perishables only. If weight exceeds 10 kg (22 lb): receiver to provide food licence. Describe weave (woven/knitted) and materials on invoice. Items of clothing: detail the composition of the material. For ship spares and x-ray machines please contact DHL Customer Services before shipping.